Former governor of Maryland Martin O’Malley, who is a potential presidential candidate from the Democratic Party, said on Sunday that the country needed fresh perspectives in order to confront its problems. He criticized the prospect of the Bush and Clinton families once again seeking residence in the White House. The United States presidency is not a crown that is to be passed between just two families, said O’Malley on an ABC News show Sunday. 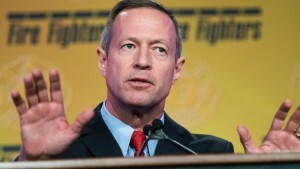 O’Malley was speaking as Hillary Clinton the former U.S. Secretary of State is considered the party’s front runner for the presidential nomination. Jeb Bush the former governor of Florida is considered a contender for the nomination of the Republican Party. The former governor of Maryland said he feels the country benefits always from new perspectives and new leadership. He added that the country needed a president who is on the people’s side, one who is willing to take on the powerful and the wealthy special interests and restore the economy. Asked if he felt Clinton would take on the special interests, O’Malley said he did not know. He said he does not know where at this point she stands, if she will break from the failed policies of before or not. Mr. O’Malley said he would decide whether if not he would run for the presidency this spring and he questioned whether the party’s nomination for Hillary Clinton, also a former first lady and senator, is inevitable. He said that history is loaded with times that the inevitable front runner is that right up until the point he or she is not any longer inevitable. His response to the panel’s questions noticeably slowed when he was asked what in his opinion was the top threat outside the U.S. that the country faced. He finally responded by saying the greatest danger we confront at this time is as far as man-made threats are concerned is a nuclear Iran and related to that extremist violence. He said the two could not be separated.